As the size and complexity of applications have grown, it has become increasingly difficult to ensure functional compliance and to ensure no regressions over time. Even a small size project can generate excessive permutations and combinations of test cases that are too big for a human to test consistently and continually. AppPerfect Web Test automates this task for you and helps you improve the quality of your Web applications and drastically reduces the time it would take to get your product out into the market. Browser recording - All the actions in Web browser are automatically recorded and replayed. Recording from multiple instances of a Web browser is also simultaneously. Element-based - It records browser interaction in terms of the actual element, rather than just screen co-ordinates. UI based editing of tests - a user friendly UI which allows to edit the existing tasks as well as add new tasks. 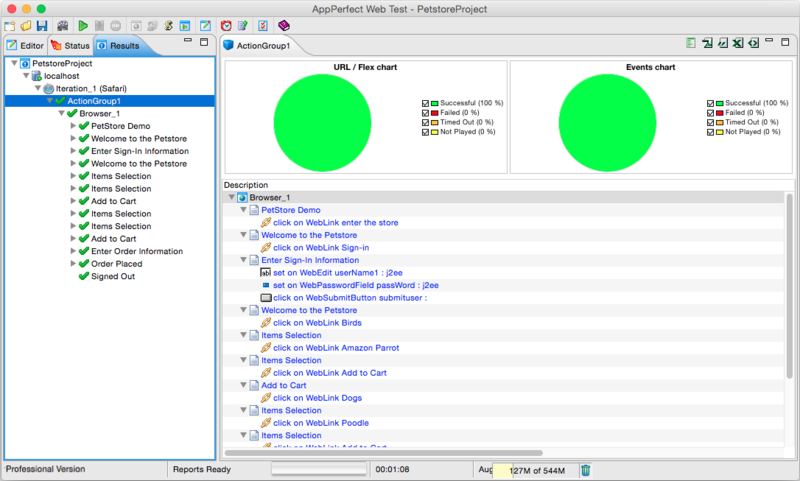 AppPerfect Functional Tester can read values from text files, databases etc. Response Validation: You can validate the responses received for a URL request. Advanced Technology : Supports functional testing applications based on .NET, ASP, Servlets/JSP, CGI, SSL, AJAX, Flash and Java Applets. Object Spy: Provides functionality to Spy on any HTML element and fetch its properties. Scripting Support: Provides scripting language support for simple java script, users can view/edit the functional test using script editor provided. Support for basic authentication, cookies, SSL: With the AppPerfect Functional Tester, you can functional test URLs that require basic authentication as well as those using HTTPS by allowing the configuration of the SSL Provider. Informative reports: Pin point failure points of the functional test. These reports are available through the UI and can be exported into various formats like HTML, PDF, CSV, XLS, XML etc.